Molice is a female fronted trio from Japan. 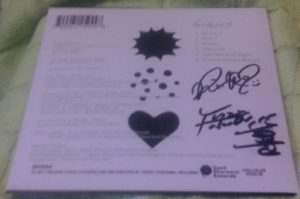 Their current line up is Rinko on Vocals and Rhythm Guitar, Yuzuru on Guitar and Hirofumi ‘Paro’ Katsumoto on Drums. 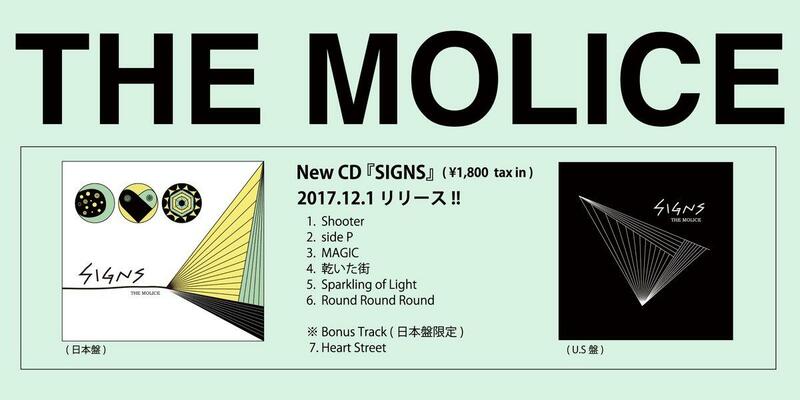 Keeping with their love of Sci-Fi, Molice’s latest CD is called ‘Signs’. This is the second CD with this line up. Molice are known for their indie sensibilities and lush soundscapes, they have played in some of the largest venues in their native Japan, toured in the US and Vietnam and have a worldwide fan base. Molice are signed to the Good Charamel Records label in Buffalo NY and the Velour Voice label in Japan. Molice formed in 2007 and have released six music CDs in the ten years since then. The US version of ‘Signs’ is reviewed here (note that the CD was purchased). A grinding guitars with a dose of funk and reverb, a relentless rhythm and Rinko’s distinct vocals. This collection starts strong with this hard-to-sit-still-while-you-are-listening-to-it track. One of the highlights on this CD. It’s a fast paced wall-of-noise music with an exhilarating militaristic drum work intro. An EDM remix would be interesting. Look up quirky in a dictionary to see if this song is listed. The music has an almost childlike quality to it with a simple refrain and fun falsetto background vocals, but it does ramble on a bit. Strangely uplifting, this song would make a great anime outro, if you wanted to leave the viewer with a positive optimistic feeling. Impressive new wave redux with just touch of gospel’s inspirational tone. Oddly enough though it is also the most mainstream-ish music track of the lot. Nice bass and drum work on intro, Rinko’s voice as clear as a bell. Unfortunately the track is too long and it loses some of its effectiveness due to its length. 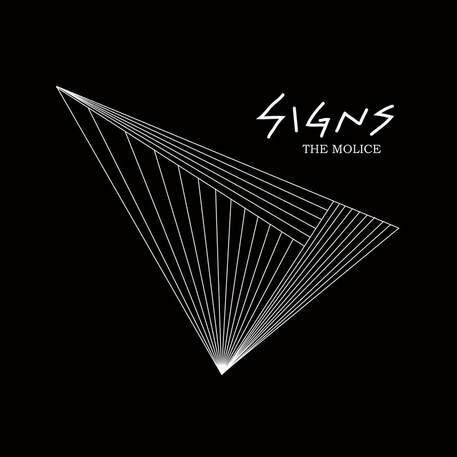 RiceburnerFM recommends ‘Signs’ by Molice. Once again Molice both defines and evolves their unique sound. Note that when / if the seventh track, Heart Street, becomes available in the US, it will be added to this review. RiceburnerFM: Any thoughts on Molice playing in NYC for the first time? THE MOLICE: We thought so, but we could realize again everyone loves music in NYC. It was really happy to feel that from experience. And we could know that THE MOLICE music can naturally live there. RiceburnerFM: Many Japanese bands play in the United States at anime conventions, but don’t tour beyond that fan base. How important is it for a Japanese band to reach beyond the anime fans and engage with the larger community of non anime music fans? THE MOLICE: We don’t know other bands things. About THE MOLICE, we are on journey of meeting fellows through THE MOLICE music. It is really important for us to dance to THE MOLICE music with them. RiceburnerFM: What is the make and model of your favorite guitar? Does your guitar have a name? THE MOLICE: Rickenbacker 320, Telecaster. RiceburnerFM: What non-Molice music are you listening to while on tour? THE MOLICE: THE MOLICE music is for playing for us. We are listening to all genre music. Because we love to get good stimulus from them. RiceburnerFM: Molice has been together since 2007, ten years and several albums later Molice is finally playing in NYC. What will Molice be doing in 2027? THE MOLICE: THE MOLICE music will be one of the new standard music of all over the world in 2027. We will make albums, tour all over the world, meet great audience, get gorgeous experiences and have nice food! RiceburnerFM thanks Molice and Tom for taking the time to answer these questions. Also Molice is even more amazing live, catch them if you can. This entry was posted in Interviews, Reviews and tagged 2017, Female Fronted, interview, J-rock, jrock, molice, new wave, review. Bookmark the permalink.